During the summer months when high temperatures and humidity combine, keeping your livestock cool and comfortable is an absolute necessity. How to keep animals cool in hot weather should be a priority. Otherwise, many can succumb to heat related stress, exhaustion, stroke—and unfortunately, death. Enclosed spaces without proper ventilation will result in serious problems for you, your animals, and your farm. How Hot is Too Hot for Livestock Animals? Maintaining productive livestock environments for cattle, sheep, horses, pigs, goats, chickens, and other animals during a heat wave is not too difficult, but it does take advanced planning. Once temperatures settle in at or above 80 degrees Fahrenheit (27 C), it’s time to implement that plan, which in large part depends upon your livestock. It may be easy to spot a horse affected by heat—horses have sweat glands and actually perspire. However, cows, pigs, sheep, and goats do not have sweat glands. Cows and pigs are very heat sensitive animals, whereas, goats and sheep are exceptionally heat tolerant animals. A cow’s mouth will hang open and its snout will become moist when it’s overheated. Chickens will spread their wings and open their beaks to seemingly gasp for air. Pig temperature requirements are important in optimizing their growth efficiency. 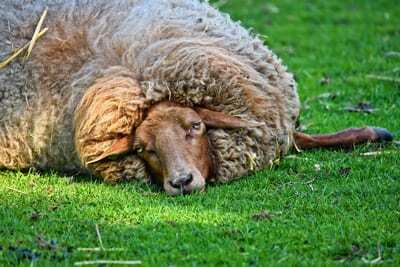 Amazingly, sheep’s wool protects them from extreme heat or cold. Once the above symptoms become visible or apparent there are several steps that can be taken to aid your animals. Though it is common sense, first action should be to provide fresh, clean, cooled water—even gently hose the animals down with a fine spray or mist. 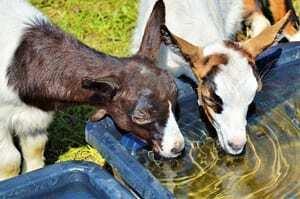 Supplying cool, clean drinking water is necessary for keeping livestock no matter what the temperature is, but is a must in extreme heat. Have watering troughs in the shade, or add automatic watering fountain systems that replenish the trough with fresh cool water several times a day. Make sure the animals are moved into a shaded area or are housed. Animals up to pasture should have ample shade. Trees throughout the pasture, or ideally, forested areas for your animals, can be much cooler than a barn. However, as many pasture lands are lacking in widespread areas of shade, keeping the barn or other farm buildings well ventilated is essential for productive environments. Because livestock will spend so much time in the barn, buildings should be properly ventilated. A proper barn ventilation system to keep animals cool and comfortable during the most oppressive heat waves. For those in need of livestock ventilation, Osborne’s multi-faceted Agri-Aide Ventilation system can be easily tailored to meet any ventilation requirements for your farm buildings. The Agri-Aide Ventilation system consists of exhaust fans, circulation fans, duct fans, fresh air inlets and ventilation controls that can be integrated into your existing system.With a variety of fan models and sizes, air can be properly circulated to promote improved health and proper dunging habits, while expelling condensation and foul odors from confinement buildings. A barn ventilation system such as the Auto-MAX® series of ceiling, wall, and hallway inlets, draw fresh air into barns, hallways, lofts and attics to keep indoor environments clean and healthy. Whatever your needs, during the hot, humid days of summer, a combination of cool, fresh water, ample shade, and well-ventilated farm buildings will ensure a healthy, productive environment for your livestock.